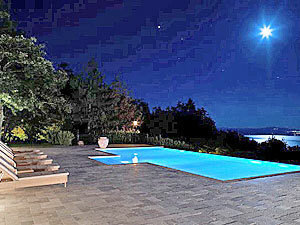 You really can have the moon and stars in this elegant and sophisticated villa that sits precariously on a hilltop position spanning the Umbrian and Tuscan borders. Elegant details from radiant heated floors, crystal chandeliers that blend seamlessly with the Italian country décor, spacious bedrooms with French doors leading out to spacious marbled terraces. The outdoors melds with the interior with large French doors that open to the terraces allowing the natural sunlight to bounce off the cool white walls and warm chestnut wood trim throughout the house. A professional kitchen is open and comfortable with a built in fireplace that defines it from the large wooden dining table. The marble flooring extends out to the multiple spacious terraces around the house and down to the heated swimming pool which holds the most incredible views, any time of the day and night. Lake Trasimeno is laid out before you, with views of Cortona and Montepulciano in the distance as well. Everything pulls together with a sense of peace and tranquility. Solid warm wood doors combined with the light colored interior and exterior colors give you a sense of warmth and serenity whether you are inside or out. The low light outdoor lighting extends your outdoor living areas well into the evenings with a relaxing and tranquil serenity as you go from dawn to noon to dusk and night, it will always feel like home. The villa does not need air conditioning thanks to the thick walls and cool breezes from the high altitude of over 2,100 feet. Available during the winter as well, the villa is warmed with central heating and radiant heated floors. Enter through an electronic gate, into a 40,000 square foot garden. Park up to three cars in the covered car port and walk across the gravel driveway to the pretty pastel pink villa and up a few short steps to a small covered porch and open the warm brown hand-hewn heavy chestnut doors. Enter into a spacious and inviting eat in kitchen. Warm terracotta floor tiles in a herringbone pattern compliment the soft white walls. A large island is the perfect place for everyone to pitch in preparing the night's dinner while the space between the island and professional oven and countertops resembles a galley kitchen with the extra bonus of opening out to the rest of the room. Between the kitchen and dining room table is an ingenious marble framed wall fireplace as if taking the place of a traditional wall oven, it is prefect for making bruschetta or just using it for ambiance . The eclectic pairing of a crystal and brass chandelier over the large country style wood dining table with wicker chairs comes off beautifully. From the dining table, a large French door leads out to the terrace. On the other side of the dining room is a little alcove with two French doors leading out to the same terrace. Here there is a day bed that can accommodate an additional person. This floor also has a hallway with built in cupboards next to a full bathroom with shower as well as the laundry room with washing machine and tumble dryer. A staircase from the kitchen leads up to the firs floor where you have 4 spacious and airy bedrooms with en suite bathrooms. Radiant heated floors are controlled by a thermostat in each bedroom. The Master bedroom has a King sized bed ( 70 inches )with a spacious bathroom with travertine marble and oversize tub with a large window with lake views. French doors lead out to a large private balcony. The second bedroom has a queen bed and French doors opening up to a French balcony ( standing only ) that overlooks the swimming pool. Its white marble bathroom includes a baby nursery area with a pretty crib. ( crib linens not supplied). The other two bedrooms are also furnished with Queen beds, the bathrooms with travertine flooring and pink marble showers. Terraces surrounds the house, which is on different levels. Immediately outside the kitchen and living room is a 800 square foot terrace with a covered loggia with dining table on one side and a sunning area with lounge chairs on the other side. Six steps down from the house takes you to the lower level terrace with lots of open space ( 2.100 square feet) . The garden includes olive trees, old fashioned roses and an avenue of cypress. There are single and double lounge chairs around a mosaic infinity swimming pool that seems to jut out towards the lake below. The swimming pool is heated, would you expect anything less? The yard is fenced in for your privacy with an iron gate and alarm system. The carport has room for three cars. . .